I've worked more on this one and am really enjoying the process. I think I mentioned earlier how much I love painting fabric. I remember back in my early college drawing class. One of the assignments was to draw a crumpled sheet. and was amazed when it actually became a piece of artwork. There's so much intricacy to the folds. Sometimes a bit challenging but in a good way! I'm planning on finishing this one today so hopefully will get it posted and listed on Etsy by tonight! Oh Jennifer. How exquisite. I love the way the light shines on the folds of her beautiful dress. Oh, this is going to be another gorgeous one. Well, of course you know how much I love your work because I buy an awful lot of it from you! But, I have to say, the skill you have with painting the ladies is really fine and are some of my favorites. I absolutely do not know how you achieve the shadows to create "bones" in a face or how you get folds in a garment; it must be one of the hardest things to do in painting or else it can look more like a comic strip. I think this one is going to be quite dramatic; you've got a great expression going on with how her body reclines and there could be more than one interpretation of what she's feeling or what mood she's in. I would think it's a real technique to develop when trying to create 'expression' - what is the painted subject trying to express to us, if anything. Thanks for taking us on the ride from beginning to final destination on the painting! Thank you so much for stopping by Vicki! I know what you mean about the cartoon look and am not sure if I always achieve the look I'm after. More practice is always needed. I hope I have conveyed an expression that speaks to you. I like to leave my paintings open to interpretation. 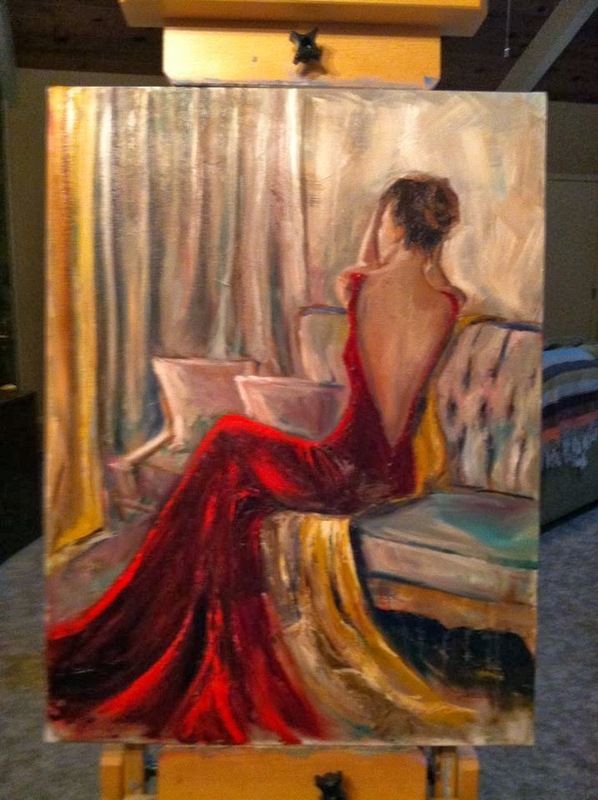 Final Woman in Red Dress Painting SOLD!